Whilst the practise and method of teaching are essential to the success of engaging pupils and stimulating learning, it must also be remembered that the very environment in which the learning process takes place can have a huge impact on children and how well they can develop their skills. In this article we’ll be looking at what makes an ideal learning space for children to engage within as well as the kind of learning space which will greatly benefit those who have special educational needs. A key element of any environment, whether it be your living, working or learning space, is comfort. Being uncomfortable in any way can cause serious distraction and disturbance to an individual and can lead to the resentment of the environment they are within. This factor is just as relevant to the learning space as any other and can be more so in the case of those who find it hard to engage with the learning process. Making sure the classroom is well heated, but also well ventilated can ensure pupils do not feel too hot or too cold at various times of the year and greatly reduce discomfort in the learning space. Other physical factors such as the chairs and desks pupils sit at can have a large impact on comfort as well. Although it may not be within every school’s budget to furnish their classrooms with high quality chairs and desks, simple changes like cushions, the chair-to-desk height ratio and proximity of the desk layout with other pupils can make significant differences to how children respond to the learning space. Keeping a classroom clean and tidy can also help improve the focus of pupils, a semblance of order rather than chaos lending itself to a more relaxed and comfortable environment. It’s always a good idea to set an example as a teacher with how your own desk is presented and perhaps to draw up a set of classroom rules created by the pupils themselves giving them a sense of respect, ownership and belonging for their learning space. Whilst comforts is key to any environment, within the learning space it is particularly important to keep pupils engaged and passionate about their learning experience. This can be difficult to achieve with every pupil, however by making one’s surroundings bright and engaging, you can go a long way towards making learning exciting for everyone. To begin with, light is an important element to any space. We are all naturally drawn towards sunlight and by having large open windows and natural white lights in a classroom, you can greatly enhance the atmosphere within which pupils learn. This in turn creates a sense of connection to the outside world, an impression of openness rather than captivity and one that can be boosted further with outdoor spaces next to the classroom in the form of gardens and outdoor learning spaces which are easily accessible to pupils from the classroom. This concept of being connected to the natural world can have a huge impact on the mood and attitude of pupils towards learning and their behaviour, and is known as biophilia. A natural and minimalist approach to the design of the learning space, both within and out, will create a connection with nature which is both relaxing and inspiring, giving the classroom an identity and purpose which simple concreate or brick structures simply cannot achieve. This connection with nature and the outdoors can be brought into the classroom to help engage and relax pupils. Indoor plants, bright natural colour schemes and murals on the walls can all help bring the outside in, factors which can all be enhanced further with natural sunlight and views of actual outside spaces. Motivation is also another way of making a learning space engaging. Whilst this can often be related to the manner by which teaching is carried out, the classroom itself can also be a key motivating factor for pupils. Along with being comfortable and relaxed, having a motivation behind the learning can make the difference between a successful or frustrated learning experience. Keep colours bright and natural without being distracting, and proudly display every pupil’s achievements in a dedicated section of the learning space to celebrate everyone’s talents and abilities. Small group spaces, adequate storage for engaging learning equipment and even dedicated reading spaces can also all go a long way to helping children feel motivated to learn and engage with each other and teachers positively. Even changing the layout of the classroom for different subjects or activities can create a huge difference to how children view their lessons and help encourage creativity and innovation in what they do. Much of what has been said above is particularly important when considering learning spaces for SEN children. The learning experience of those with learning difficulties can be greatly benefitted by removing distractions and providing a safe, structured environment alongside clear routines in the classroom. The elements of comfort, relaxation, motivation and inspiration are all essential to the SEN learning experience and must be seriously considered if pupils are going to engage with and enjoy the environment they are within. Again, many of these elements can be fulfilled with the use of natural light, easy access to the outside world and outside learning as well as the choice of colours and natural, interior design. Having small class sizes set in dedicated but open spaces is a brilliant way to create a relaxed and comfortable setting for children with many different needs. Having plenty of room for wheelchairs and personal space is essential for helping SEN pupils adapt and feel comfortable in their environment, and having easy access to facilities such as toilets, cloak rooms and outdoor learning spaces can greatly enhance the learning experience for everyone. Creating a sense of identity within the classroom, and certain parts of the learning space, is central to helping pupils associate the activity they will be carrying out in each area and room. This will help increase engagement and a relaxed atmosphere for those with special needs as they recognise what part of the learning space belongs to specific activity or task. Examples of this kind of zoning in SEN learning spaces include dedicated reading, crafting and sensory areas where pupils can interact with various aspects of learning with the comfort knowing what that space is for. Other areas such as group instruction areas, individual tuition spaces and calm areas can also greatly benefit the learning experience for SEN pupils, providing places for those with different needs to relax and engage with other pupils as and when needed. It is always a good idea to make these space and areas as easily accessible as possible and for them to be fitted appropriately. Muted colours, gentle lighting, comfortable seating and, when needed, screens for privacy must all be taken into account as well as making sure they are still flexible enough for the individual needs of every pupil. If you would like to find out more about how learning spaces can be made engaging and inspiring through the use of natural materials and outdoor spaces, TG Escapes has an extensive range of case studies and testimonials which cover our modular eco-classrooms. 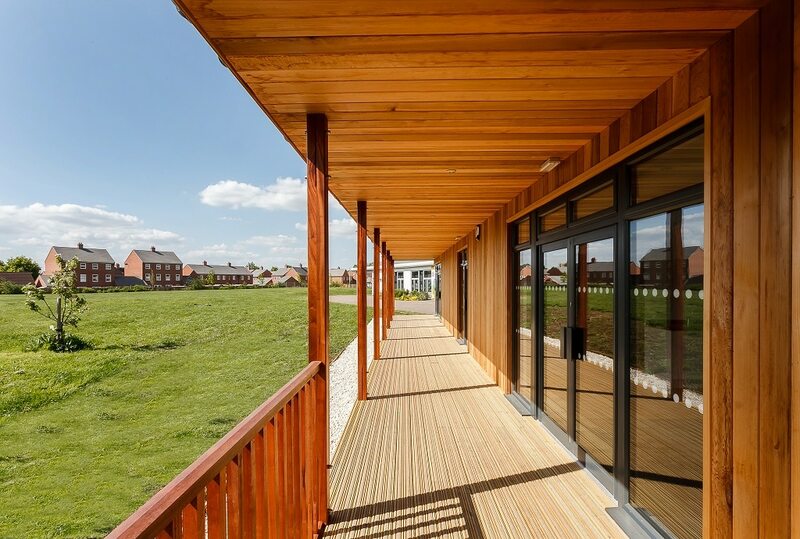 These classrooms are designed to fulfil all the elements needed to make the ideal learning space for pupils and help integrate them with the natural world and learning.